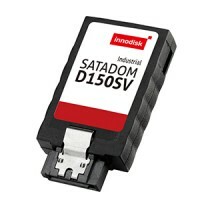 Твердотельные диски SATADOM купить | Innodisk в Украине – официальный дистрибьютор компания ХОЛИТ Дэйта Системс. 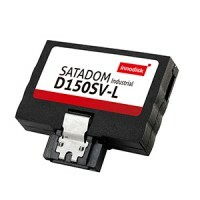 Твердотельный диск SATADOM D150SH with Toshiba(Pin7 Integrated)(Industrial, Standard Grade, 0℃ ~ +70℃)Qualified by Intel, InnoDisk’s SATADOM™ D150SH is the world’s smallest SATA SSD, featuring built-in Pin 7 VCC that enhances the functionality of various embedded applications. With its cable-less an..
Твердотельный диск SATADOM D150SH with Toshiba(Pin7 Integrated)(Industrial, W&T Grade, -40 ~ 85℃)Qualified by Intel, InnoDisk’s SATADOM™ D150SH is the world’s smallest SATA SSD, featuring built-in Pin 7 VCC that enhances the functionality of various embedded applications. With its cable-less and rug..
Твердотельный диск SATADOM D150SH-L with Toshiba (Pin7 Integrated)(Industrial, Standard Grade, 0℃ ~ +70℃)Qualified by Intel, InnoDisk’s SATADOM™ D150SV-L is the world’s smallest SATA SSD, featuring built-in Pin 7 VCC that enhances the functionality of various embedded applications. With its cable-le..
Твердотельный диск SATADOM D150SH-L with Toshiba(Pin7 Integrated)(Industrial, W&T Grade, -40 ~ 85℃)Qualified by Intel, InnoDisk’s SATADOM™ D150SV-L is the world’s smallest SATA SSD, featuring built-in Pin 7 VCC that enhances the functionality of various embedded applications. With its cable-less and..
Твердотельный диск SATADOM D150SH-L with Toshiba(Pin7 Integrated)(With Spacer Hole, Industrial, W&T Grade, -40 ~ 85℃)Qualified by Intel, InnoDisk’s SATADOM™ D150SV-L is the world’s smallest SATA SSD, featuring built-in Pin 7 VCC that enhances the functionality of various embedded applications. 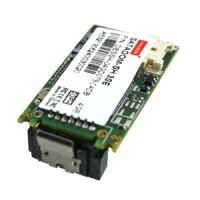 With ..
Твердотельный диск SATADOM D150SV with Toshiba (Pin7 Integrated)(Industrial, Standard Grade, 0℃ ~ +70℃)Qualified by Intel, InnoDisk’s SATADOM™ D150SV is the world’s smallest SATA SSD, featuring built-in Pin7 VCC that enhances the functionality of various embedded applications. With its cable-less an..
Твердотельный диск SATADOM D150SV with Toshiba(Pin7 Integrated)(Industrial, W&T Grade, -40 ~ 85℃)Qualified by Intel, InnoDisk’s SATADOM™ D150SV is the world’s smallest SATA SSD, featuring built-in Pin7 VCC that enhances the functionality of various embedded applications. With its cable-less and rugg..
Твердотельный диск SATADOM D150SV-L with Toshiba (Pin7 Integrated)(Industrial, Standard Grade, 0℃ ~ +70℃)Qualified by Intel, InnoDisk’s SATADOM™ D150SV-L is the world’s smallest SATA SSD, featuring built-in Pin 7 VCC that enhances the functionality of various embedded applications. With its cable-le..
Твердотельный диск SATADOM D150SV-L with Toshiba(Pin7 Integrated)(Industrial, W&T Grade, -40 ~ 85℃)Qualified by Intel, InnoDisk’s SATADOM™ D150SV-L is the world’s smallest SATA SSD, featuring built-in Pin 7 VCC that enhances the functionality of various embedded applications. 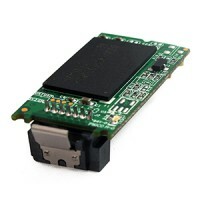 With its cable-less an..
Твердотельный диск SATADOM-SH 3SE(Industrial, Standard Grade, 0℃ ~ +70℃)Innodisk SATADOM™-SH 3SE is designed as the standard SATA 7 pin connector with SATA interface, and supports SATA III standard (6.0Gb/s) with excellent performance., Innodisk SATADOM™-SH 3SE absolutely replaces the traditional ha..
Твердотельный диск SATADOM-SH 3SE(Industrial, W&T Grade, -40 ~ 85℃, Thermal Sensor)Innodisk SATADOM™-SH 3SE is designed as the standard SATA 7 pin connector with SATA interface, and supports SATA III standard (6.0Gb/s) with excellent performance., Innodisk SATADOM™-SH 3SE absolutely replaces the tra..
Твердотельный диск SATADOM-SH 3SE Type C(Industrial, Standard Grade, 0℃ ~ +70℃)Innodisk SATADOM™-SH 3SE is designed as the standard SATA 7 pin connector with SATA interface, and supports SATA III standard (6.0Gb/s) with excellent performance., Innodisk SATADOM™-SH 3SE absolutely replaces the traditi..
Твердотельный диск SATADOM-SH 3SE Type C(Industrial, W&T Grade, -40 ~ 85℃, Thermal Sensor)Innodisk SATADOM™-SH 3SE is designed as the standard SATA 7 pin connector with SATA interface, and supports SATA III standard (6.0Gb/s) with excellent performance., Innodisk SATADOM™-SH 3SE absolutely replaces ..
Твердотельный диск SATADOM-SH 3SE Type C with Pin7 VCC Supported(Industrial, Standard Grade, 0℃ ~ +70℃)Innodisk SATADOM™-SH 3SE is designed as the standard SATA 7 pin connector with SATA interface, and supports SATA III standard (6.0Gb/s) with excellent performance., Innodisk SATADOM™-SH 3SE absolut..
Твердотельный диск SATADOM-SH 3SE Type C with Pin7 VCC Supported(Industrial, W&T Grade, -40 ~ 85℃, Thermal Sensor)Innodisk SATADOM™-SH 3SE is designed as the standard SATA 7 pin connector with SATA interface, and supports SATA III standard (6.0Gb/s) with excellent performance., Innodisk SATADOM™-SH ..